Taking a break from working late tonight, I went to McDonald’s to get some quick dinner. While at the drive thru I took this picture with my iPhone. 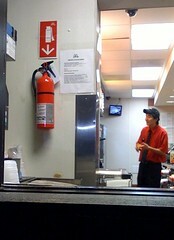 I’m not entirely convinced that the sign above the fire extinguisher is necessary. © copyright 2019 charles skoda, all rights reserved.